Every year I try to get at least one public fat burning Fat X Project done. For those of you new to Fat X 101, a Fat X Project is a client that I personally put through my 12 day Fat X Program. A public Fat X Project is when I put out the before and after transformation pictures on the internet publicly. I do these public Fat X Projects, not only to prove the efficacy of my 12 day Fat X Program (FX12), but it's also meant as motivation. 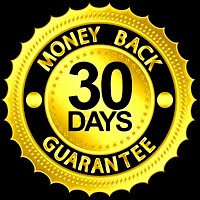 I want everyone to know that this fitness plan is not just for athletes, workout fanatics, or fitness enthusiasts. Anyone that is willing to focus and dedicate themselves for at least 12 days can get great results with it. Also, any personal trainer or fitness coach can put their clients through it to burst through plateaus and achieve new fitness, and fat loss (weight loss) goals. Recently, Gabby found me when she was searching for a personal trainer in Pasadena and she bravely stepped up and agreed to have her before and after photos posted. She was extremely self conscious, so I decided I would only post partial photos (for now). She was extremely happy with her results and has signed on to continue her training workout program with me, so I will post more photos at a later date. 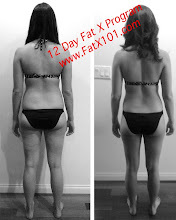 Once Gabby decided she was willing to go ahead with the project, we set a start date, I walked her through the basics of the Fat X Diet and we got started on the FX12! This project from the jump had several difficulties we had to navigate through. Actually, there are always difficulties, but in this case, a very important one was scheduling the workouts. On several occasions, because Gabby is a local radio DJ and works the overnight shift, she had to come to me for morning workout sessions on only a few hours sleep. Another difficulty was that I had to cut her off cold turkey of her morning Starbucks addiction. Not that I have a problem with coffee and or caffeine, I'm actually a big fan, but not her choice of drink which had been a White Chocolate Mocha. That drink has 18 grams of fat and a whopping 63 grams of carbohydrates (59 grams sugar). It's definitely not conducive to a fat loss goal and it can be a huge dagger in the heart of healthy diet. For the most part, Gabby did a really good job of sticking to the Fat X Diet. She replaced the White Chocolate Mocha with either black coffee, or green tea. I OK'd the use of light dairy creamer for her morning coffee and she did that occasionally. She did have one big slip! After the sixth day of the FX12, she almost derailed the project by going out with her friends and having several beers that night. The next day her workout was not up to par and I was extremely disappointed. But, I did have a talk with her that reinvigorated her motivation and she did really well the rest of the way! Unfortunately for my marketing purposes, Gabby's biggest problem area and largest body fat deposit was a bit covered up in the before picture. I should have had her wear a swimsuit on both photos, but since I hadn't done one of these Fat X Projects in a while, I did make the mistake of forgetting details such as that and I also didn't want to scare her away. Keep in mind I do these public Fat X Projects without any help, meaning the photos are taken by me and while I dabble in photography, I'm no pro. In any case, this first Fat X Project for 2013 was definitely a success, and while you can see a big difference in the photo, that's just the beginning. It was taken the day after she completed the FX12. Due to her improved fitness level, and revved up metabolism, I'm confident that the fat burning (fat loss) results will continue to snowball. Feel free to contact me with any questions. Have you been looking for a personal trainer? Contact me ASAP and start getting better results faster with my brand of unique fitness coaching. I'm in the city of Pasadena, and I'm always willing to work with new clients that are ready to get fit and shed some unwanted body fat (lose weight).